The symbolism of Orange colored butterflies and Orange Butterfly mythology, legends, superstitions and associated folklore from around the world. Like all the different colored butterflies, an orange butterfly has several different symbolic meanings. An orange butterfly represents passion, but it can also represent agressiveness. This can be positive or negative depending on what the passion is for. An orange butterfly sighting can remind us to stay focused on or follow through with a plan or project until its complete. The orange butterfly is associated with the sun, life and consciousness. Spotting an orange colored butterfly can signify that a new dawn of healing and heart transformation is about to occur for someone who has been depressed or anxious. 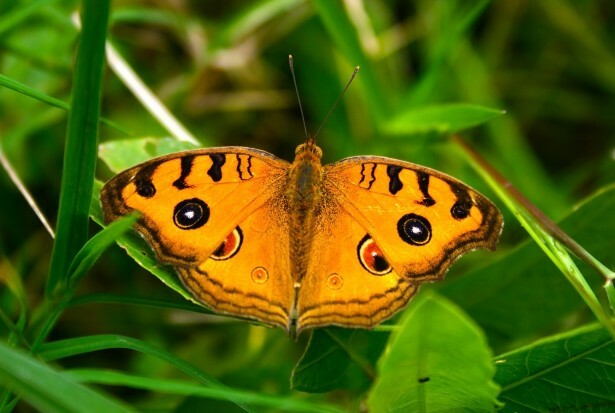 Orange colored butterflies have also been associated with courtesy, friendliness and liveliness. Seeing an orange butterfly reminds us to stay positive. Having an orange butterfly land on you or fly near you means that joy will soon come into your life in some unexpexted way. An orange butterfly can also encourage us to be more socialble or outgoing, or seeing one can indicate that a visitor will soon arrive, or an invitation to a social event is coming--especially if the butterfly is flying inside or around the home. Many believe that an orange butterfly represent rebirth. Seeing one often leads to a shift in perspective on something.